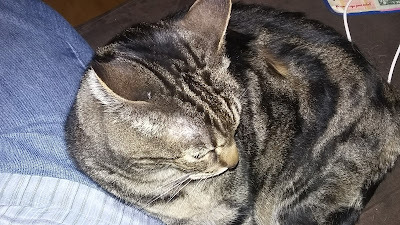 Our very shy cat, Lucy, decided to watch soccer. I think she liked it. It's very rare when my regular work world and my Timbers work worlds collide, but sometimes it happens and there's not much to do about it. When I'm not sitting behind a computer or on a phone talking about Timbers soccer and providing what I hope is thoughtful insight, I work in the financial world as a IT business analyst. It's not glamorous work, but it pays the bills and in the many years I've been part of the company, I have experienced some nice perks along the way. 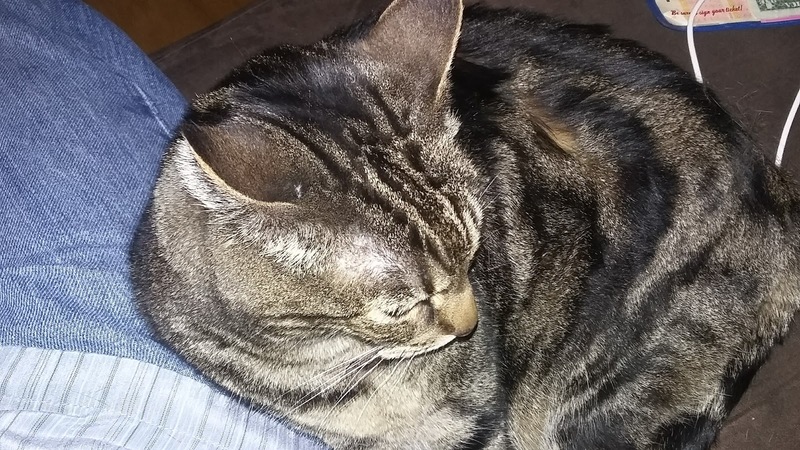 Imagine my surprise, however, when I was informed that our new weekend release procedures involved me having to get up at 4 AM Sunday morning to manage my code migration. If you understand any or all of those words, congratulations; for those that don't, let's just say that I got asked to do something really technical when most folks are still dozing and dreaming about whatever. The fact that this fell on the same weekend as the Portland Timbers - FC Dallas home match was unfortunate, but upon chatting with my wife and reviewing the potential weather forecast, we decided the smart play was to cozy up at home and watch the game on the big screen. The fact that the weather turned out to be no concern and the rain stayed away was annoying, but the situation did allow me to watch the Timbers broadcast crew in great depth as they covered an intriguing matchup between 2 of the better sides in the Western Conference. The last time the teams met back on April 29 in Texas, it was a back and forth slugfest that eventually ended in a 2 all draw; many Timbers fans will remember this match as one where Portland had leads at 2 separate times and eventually defensive lapses cost them the full 3 points. With both sides missing several players for international duty - Portland was without David Guzman (Costa Rica) and Darlington Nagbe (USA) while FC Dallas was missing Kelly Acosta and Matt Hedges (USA) and Maynor Figeroua (Honduras) - it came down to which side could execute better using a mix of rotational players and key reserves. 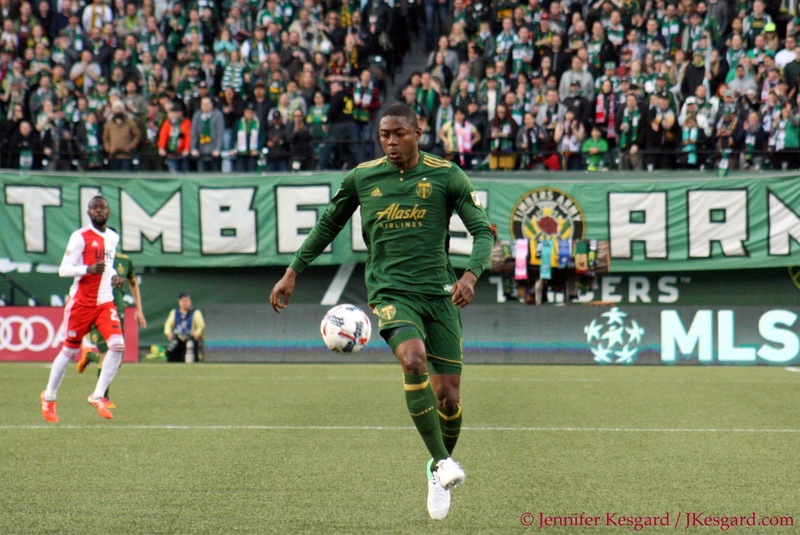 For the Timbers, it also came down to several in match adjustments due to injuries that could have crippled their approach, but instead, the players rallied around the rejuvenated Fanendo Adi putting up another brace to post an impressive 2 to 0 victory in front of another Providecne Park sellout. Adi has been struggling but he broke out in a big way. FC Dallas held Tesho Akindele from joining the Canadian National Team until after this match, so FCD Coach Oscar Pareja was able to team them up with regular wing Michael Barrios and recent addition Roland Lamah, who had a hat trick last week versus Real Salt Lake. With Victor Ulloa and Carlos Gruezo manning their usual defensive midfield roles, FC Dallas effectively had their first choice attack available. With Nagbe gone, Portland again turned to Dairon Asprilla to team up with Sebastian Blanco, Diego Valeri and Adi to form the quadrant of attack. 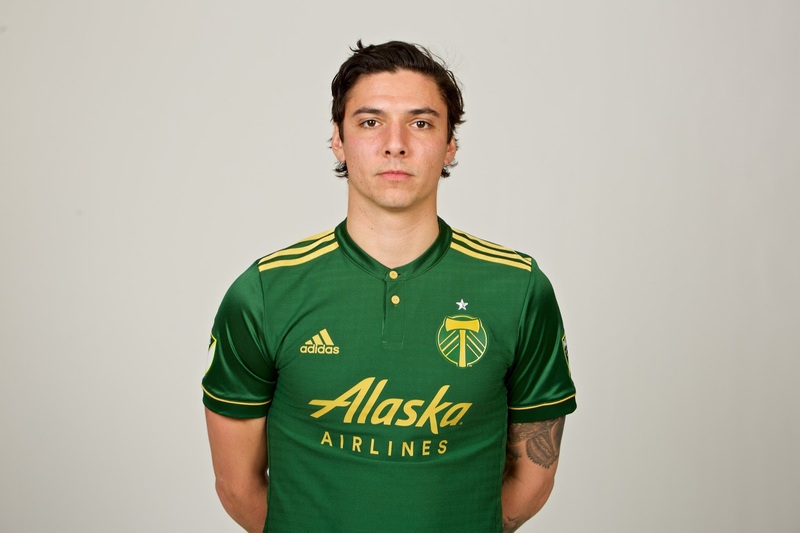 Without Guzman, Timbers Coach Caleb Porter would turn to Lawrence Olum to pair with Diego Chara in the defensive midfield in front of center backs Roy Miller and Liam Ridgewell with Vytas and Zarek Valentin as the fullbacks. The majority of this group put forth an inspired effort at home against San Jose on June 3 to post a 2 to 0 win behind a Valeri brace, but this match brought forth far more challenges than those faced versus the Earthquakes: battling a club with a vaunted offense with 21 goals and 11 allowed in 13 matches, Portland facing 4 matches in 13 days that start and end with matches versus the Flounders, and Porter using 3 different center back combos to finish up the victory due to injuries. In retrospect, this was the most complete team victory that I've seen from the Timbers because everyone contributed to the overall outcome in their own way. Much of the attention would be heaped upon Adi, who broke out of a mini scoring slump of 5 matches as he hadn't scored since that April 29th meeting in Texas. 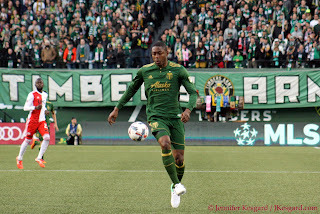 The massive striker registered his 13th brace of his Timbers career with goals in the 32nd and 72nd minutes that pushed his overall goal total wearing the Timbers crest to 49 goals halfway through his fourth season in the Rose City. Amobi Okugo created a turnover in the 32nd minute and fed Blanco with a great pass in motion, and the Timbers midfielder laid a pass to Adi on the left portion of the FC Dallas box, and the striker was able to toe punch the ball past FC Dallas goalkeeper Jesse Gonzalez to put the Timbers up 1 to 0. Adi added his second in the 72nd when the Timbers caught FC Dallas forward, and the foursome of Chara, Valeri, Asprilla and Adi were able to spring forward. Valeri sent Asprilla forward with a lovely diagonal ball to the right corner heading towards the North End goal, and Dairon was able to run onto the ball and launch a cross into the box. Chara executed a lovely dummy run that caught several FCD defenders flat footed, and the ball instead ended up with Adi and only a sprawling Gonzalez between him and goal. A simple tap in was enough to register the brace, but Adi had several other close efforts that could have made him the first MLS Timber to score a hat trick in the MLS regular season. Zarek Valetin came up huge for the Timbers all night. Focusing upon Adi, however, would ignore several other contributions. Asprilla, filling in for Nagbe, again executed flawless forward runs and provided some great offensive support in both halves, even after he and Blanco switched sides for the second half. Blanco was a warrior in pouring forward, and earned his third assist of the season for his efforts. Valeri was the orchestrator for the offense, and earned his team leading 5th assist on Adi's second goal although he didn't add to his goal scored mark, leaving he and Adi now tied in goals scored in 2017 with 8. Olum filled in well with Chara in the defensive midfield for the first 26 minutes of the match, but when Ridgewell had to leave for a leg injury, Olum moved to center back alongside Miller as Okugo replaced him in the center midfield. Okugo found himself moving to the backline in the second half when Miller, injured in a collision in the 1st half with Urruti where the former Timbers striker rolled up his leg, couldn't continue, and so Ben Zemanski came on for him in the 61st minute to push Okugo back to center back with Olum. While it was impressive to see Portland negotiate 3 separate center back tandems - Ridgy & Miller, Miller & Olum, Olum & Okugo - for the match, Chara worked seamlessly with Olum, Okugo and Zemanski to provide cover in the middle all night. The Timbers also received tremendous support from their fullbacks, and if I had to choose men of the match, I would give the awards to Vytas and Valentin for their work. In the 22nd minute, FC Dallas got forward and Barrios found Lamah six yards from goal with a cross, and while Gleeson was able to deflect the shot away, it kept spinning towards the inner left post towards goal. Valentin, keeping his wits about him, was able to orient himself and clear the ball as it was nearing the goal line, thus keeping it from being a goal. This wasn't his only solid work as Valentin was able to keep the myriad of FC Dallas wings busy, but perhaps the best defensive work of the night belongs to Vytas. Barrios is quite simply a handful, and the fact that his influence was severely limited to a few meaningful crosses and two shots was impressive. FC Dallas only registered two shots on goal for the night, a figure that was one of their lowest of the season, but Portland was helped by the efforts of FCD substitute Cristian Colman, who entered in the 57th minute for Akindele. On two separate occasions, Colman had a clear path and shot on goal and on both efforts, Colman launched near vertical shots that weren't even close to being on frame. 2 matches, 2 clean sheets. Not bad. Luck wasn't the biggest component of this result, as simply stated, Portland executed a tremendous team approach where they got meaningful contributions from their starters and bench. They cannot relish this result too much, as the team travels to Starfire Soccer Complex for their opening round U.S. Open Cup match on June 13 to play the Sounders FC. Portland is going with a youth approach for this match, calling up 9 members of the Timbers 2 side on short term loans to play in this date as Portland also faces 3 league matches within the next week - June 17 in Colorado to battle the Rapids, June 21 in Minnesota to play expansion side Minnesota United FC, and their second of three Cascadia Cup regular season dates with the Sounders in Portland on June 25. It doesn't get any easier as Portland travels to Kansas City to play Sporting KC on July 1 and the stretch ends on July 5 when the Timbers host the Chicago Fire before there is a break in fixtures. Nobody is going to feel sorry for the Timbers about the pileup in dates, but honestly, if Porter can elicit this type of effort each and every week, this group will be just fine.